Pancreatic cancer is one of the most aggressive malignancies, with a 5-year overall survival of less than 5%. Tumor drug resistance to conventional chemotherapy, such as Gemcitabine, is often a significant contributor to poor overall survival. One of the common mechanisms of Gemcitabine resistance is activation of cell signaling via increased phosphorylation of mitogen-Activated kinase (MAP) kinases, leading to increased tumor survival and reduced sensitivity to chemotherapeutic agents. A growing body of evidence suggests that the CXCL12/CXCR4 signal transduction axis in the tumor microenvironment is an important mediator of tumor migration, growth, and drug resistance. We hypothesized that stromal cells such as carcinoma-associated fibroblasts (CAFs), an important cellular component of the tumor microenvironment (TME), play a contributory role in the growth, invasiveness, and drug response of pancreatic cancer cells (PCCs) by activating CXCL12/CXCR4-mediated signal transduction. To test this, we used an in vitro model system to study the growth, invasion, and drug response of human PCCs in the presence or absence of in vitro generated CAFs and their precursors, the mesenchymal stem cells (MSCs). Functional studies demonstrated that co-culture of PCCs with CAFs led to signifi-cant increase in tumor cell invasion, which was abrogated by blockade of CXCR4 by plerixafor (AMD3100), a CXCR4 antagonist, and by siRNA-mediated knockdown of CXCR4 in CAFs. Further, we examined the effect of AMD3100 on the chemoresistance of PCCs to Gemcitabine. Our results indicated that AMD3100 reversed Gemcitabine-mediated chemoresistance of PCCs cells in the presence of CAFs or CAFconditioned media. In co-culture with pancreatic cancer cells, CAFs induced activation of MAPK signaling pathways and enhanced transcription of Mn-superoxide dismutase (SOD), glucose 6-phosphate dehydrogenase (G6PD), and catalase, genes involved in reactive oxygen species (ROS) pathways. Using Phloretin (a natural flavonoid found in apple leaves), a ROS inhibitor, we observed attenuation of MAPK signaling, SOD activity, and reversal of drug resistance in CAF-exposed pancreatic cancer cells. Phloretin in combination with Gemcitabine produced remarkable antitumor effects in a tumor xenograft model in immune compromised animals. These findings implicate CXCL12/CXCR4-dependent MAPK signaling and ROS pathways in CAF-mediated modulation of the growth, migration, and drug resistance of PCCs and provide a rationale for developing combination therapies for control of pancreatic cancer. About 80% of pancreatic cancer is adenocarcinoma of the ductal epithelium and only 2% of tumors of the exocrine pancreas are benign [1–3]. Pancreatic cancer is one of the most aggressive malignancies in the United States, with a 5-year overall survival of only 5% . Worldwide there are around 279,000 new cases each year  with direct medical care costs in the US associated with pancreatic cancer are estimated to be $881 million annually . According to The Pancreatic Cancer Action Network special report, there is an alarming rise in pancreatic cancer in the US and by the year 2020 pancreatic cancer will move from the fourth leading cause of cancer death to the second leading cause of cancer death . At diagnosis, only 20% of pancreatic cancer patients are candidates for surgical resection of the tumor. Treatment with Gemcitabine has been the treatment of choice during the last decade. Resistance to Gemcitabine is an issue with pancreatic cancer treatment. Current research is directed toward identification of novel potential targets to enhance cytotoxic effects of Gemcitabineon cancer cells [7, 8]. The involvement of CXCR4/CXCL12 signaling pathway has been investigated in the migration and invasion of many types of cancer. It was reported that CXCL12 could induce migration and invasion of many types of cancer (reference). Recently, several studies have been conducted to understand the role of CXCR4 and CXCL12 (also known as stromal-derived factor-1, SDF-1) in the development of drug resistance in solid tumors . CXCR4 is a seven-transmembrane with seven helical regions connected by six extramembrane loops G-protein coupled chemokine receptor, encoded on chromosome 2. CXCR4 binds its ligand CXCL12 and activates the downstream proteins, mitogen-activated protein kinases (MAPK) signaling pathway, leading to alteration of gene expression, actin polymerization, cell skeleton rearrangement and cell migration. The cells of the innate immune system also express CXCR4, which allows trafficking of these cells to the inflammation site toward CXCL12. CXCR4-expressed on CD4+ T-cells was discovered to play a role as a co-entry receptor for human HIV-1 . CXCR4 overexpression has been shown in more than 20 human cancers including breast, ovarian, prostate, esophageal, melanoma, neuroblastoma and renal cell carcinoma. Furthermore, mouse models show evidence that targeting CXCR4 inhibits invasiveness of cancer cells and development of metastasis in breast cancer, colon cancer, prostate cancer, hepatocellular carcinoma, osteosarcoma and melanoma, suggesting that CXCR4 may play a contributory role in cancer growth and metastasis [20–22]. Oxidative stress and the accumulation of reactive oxygen species (ROS) such as superoxide anion (O·–2), hydroxyl radicals (OH–), and hydrogen peroxide (H2O2) are thought to may play a role in cancer cells invasion and progression . The major cellular source of ROS is through the mitochondrial complexes I and III, where electrons from NADH or FADH2 react with oxygen to produce superoxide anions. ROS is also produced in the cytosol by intracellular enzymes such as oxidases . It is well known that ROS oxidize DNA, lipids and protein and lead to cell death . Normal cells control ROS levels by balancing the generation of ROS with ROS elimination. Some of the main antioxidant systems used to maintain ROS homeostasis are the glutathione reductase, superoxide dismutase (SOD) and catalase system . Cancer cells exhibit more ROS stress than normal cells do. Low levels of ROS are necessary for cancer cell survival, since high ROS levels can inhibit tumor growth. In fact, some of the chemotherapeutics, including Gemcitabine, kill cancer cells by inducing ROS stress in cancer cells . Several studies had shown a relationship between ROS and CXCR4 in cancer cells . Current evidence suggests that the tumor microenvironment consisting of immune cells, fibroblast cells and stromal cells work together to control the production of ROS, thereby enhancing cancer progression . The leading therapeutic for pancreatic cancer is Gemcitabine which is technically a pro-drug. After influx into the cell Gemcitabine undergoes phosphorylation to Gemcitabine triphosphate (an active form) and inhibits DNA synthesis . Resistance to Gemcitabine is often a significant contributor to poor overall survival in pancreatic cancer. One of the common mechanisms of Gemcitabine resistance is activation of cell signaling via increased phosphorylation of mitogen-activated kinase (MAP) kinases, leading to increased tumor survival and reduced sensitivity to the drug. Recent studies have demonstrated that Gemcitabine sensitivity of pancreatic cancer cell lines to be correlated with reactive oxygen species (ROS) levels. Studies also have shown that Gemcitabine as monotherapy induces the levels of ROS while depletion of ROS by N-acetyl-L-cysteine (NAC) significantly decreases the percentage of cancer cell death by Gemcitabine, indicating that ROS production could be an important mechanism of Gemcitabine resistance in pancreatic cancers . Re-sensitization of cancer cells to Gemcitabine can be achieved by regulating the oxidative stress, since ROS induction is one of the mechanisms of anticancer activitiesof Gemcitabine. Accordingly pancreatic cancer cells with lower basal levels of ROS are more resistant to Gemcitabine compared with cells with higher ROS levels. Given the importance of the ROS system in cancer, it has become an interesting potential target for anticancer drug discovery and improving current treatment. We have focused our studies on Phloretin, a natural dihydrochalcone found in apple tree leaves. Phloretindisplays potent antioxidant activity, inhibits active transport of glucose into cells by SGLT1 and SGLT2. It also inhibits GLUT2, glucose reabsorption and urea transporters and induces urea loss and diuresis [12, 13]. Previous studies indicate that this natural antioxidant may directly modulate ROS system and may be considered as an effective source for controlling oxidative damage in cancer. Cancer cells are generally under high oxidative stress compared to normal cells and are more dependent on antioxidant enzymes. Therefore, inhibition of antioxidant enzymes or ROS modulation may lead to higher ROS-mediated damage. For many years, cancer research has focused mainly on the cancer cell and its molecular changes; however, an increasing body of evidence suggests that the tumor microenvironment (TME) is an important factor in mediating tumorigenesis and chemotherapeutic resistance. The host stromal response to an invasive epithelial carcinoma is called a desmoplastic reaction and is an important feature of pancreatic adenocarcinoma . The desmoplastic reaction is characterized by a complex interplay between the normal host epithelial cells, invading tumor cells, stromal fibroblasts also called carcinoma associated fibroblasts (CAF), inflammatory cells, proliferating endothelial cells, an altered extracellular matrix, and growth factors activating oncogenic signaling pathways by autocrine and paracrine mechanisms. CAF are distinguished from normal fibroblast (NFs) by their increased ability to express factors associated with degradation of the extracellular matrix (ECM), increased angiogenesis, and elevated tumor cell growth and invasiveness . Given that the tumor microenvironment plays an important role in promoting tumor growth and invasion it is likely to influence drug resistance as well. We hypothesized that the tumor microenvironment, and in particular the stromal cells, play a major role in drug response of pancreatic cancer cells (PCCs). Preliminary work showed that exposure of CAF to conditioned medium from pancreatic cancer cells results in overexpression of the chemokine receptor CXCR4 as well as its ligand CXCL12. This effect was abrogated by blockade of CXCR4 by ADM-3100, an antagonist of CXCR4 . Several studies have shown that stromal cells can induce resistance to various anticancer treatments, such as tamoxifen in the treatment of breast cancer, paclitaxel in the treatment of non–small cell lung cancer, cetuximab in treatment of head and neck squamous cell carcinoma and cytarabine in treatment of acute leukemia . Stromal cells secrete (SDF-1) CXCL12, the ligand for CXCR4 suggesting an autocrine role for CXCL12 in stromal cells activation. CXCL12, in a paracrine fashion, is thus expected to activate cancer cells . CXCL12, upon binding to CXCR4 stimulates various signaling pathways related to cell survival, proliferation and migration. The signaling pathway of CXCR4 involves activation of mitogen-activated protein (MAP) kinase pathways leading to the activation of processes such as cell survival, proliferation increase in intracellular calcium and gene transcription as well as cell migration and possibly drug resistance . Agents such as AMD3100 (Plerixafor), an FDA approved drug with limited side effects, is one of the agents that have been developed that block CXCL12/CXCR4 axis. CXCL12/CXCR4 axis inhibitors are used in combination with other anticancer drugs and have shown promising effects. Stromal cells secrete SDF-1 (CXCL12), the ligand for CXCR4 suggesting an autocrine role for SDF-1 (CXCL12) in stromal cells activation. CXCL12, in a paracrine fashion, is thus expected to activate cancer cells. CXCL12, upon binding to CXCR4 stimulates various signaling pathways related to cell survival, proliferation and migration. CXCR4 positive cancer cells migrate to CXCL12-rich tumor microenvironment. This migration of cancer cells result in metastasis (as depicted in Figure 1). 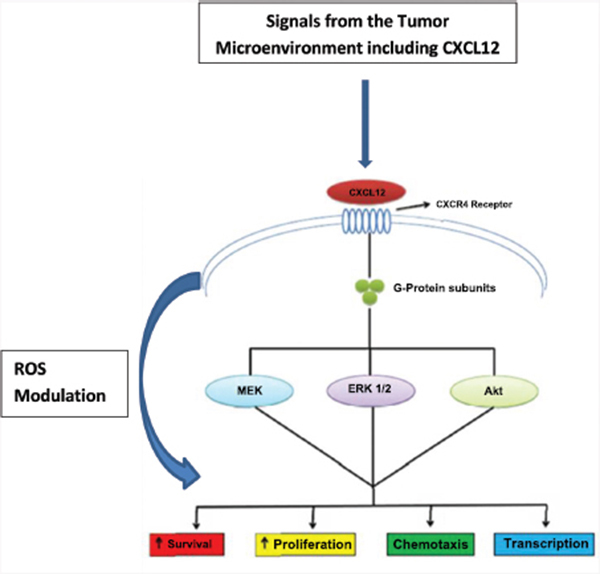 Figure 1 Schematic diagram of known CXCR4/CXCL12 downstream signaling pathway. Binding of CXCL12 to CXCR4 receptor leads to activation of ERK, Akt and MEK and increased survival, proliferation, chemotaxis and gene transcription. High levels of CXCL12 expressed by stromal cells directly stimulated the proliferation and invasiveness of cancer cells in a paracrine manner. Presence of high CXCL12 levels in the tumor attract CXCR4-positive inflammatory, vascular and stromal cells into the tumor site, where cells will support the tumor growth by secreting growth factors, cytokines, chemokines and proangiogenic factors. A novel role of CXCL12/CXCR4 interaction appears to be modulation of reactive oxygen species (ROS) in cancer cells. We further hypothesized that stromal CAFs activate enzymes such as superoxide dismutase (SOD) in cancer cells and contributes to tumor growth. Inhibiting CAF induced enzyme systems which modulate ROS activation in cancer cells may be an additional antitumor approach. Cell lines and culture conditions human pancreatic cancer cell lines (Panc-1 and HTB147) were obtained from ATCC (Manassas, Virginia) and maintained in Dulbecco’s Modified Eagle’s Medium (DMEM). Media was purchased from SIGMA Life Science (St. Louis, Missouri), supplemented with 10% fetal bovine serum (FBS) and 1% penicillin and streptomycin. Cells were grown at 37°C with 5% CO2 in humidified atmosphere. We used two human pancreatic cancer cell lines, Panc-1 and HTB147 as they had different growth rates. Panc-1 cell line has higher growth rate than HTB147 cell line. Gemcitabine was provided by the Pharmacy at Rutgers Cancer Institute of New Jersey (RCINJ). AMD3100 octahydrochloride hydrate was purchased from Sigma Life Science (St. Louis, Missouri). Phloretinwas purchased from Fisher Scientific (Pittsburgh, PA). Panc1 and HTB147 cells were seeded into the bottom chambers of a Boyden Chamber Plate from BD Falcon (Franklin Lakes, New Jersey) and the accompanying Panc-1 (or HTB147) or MSCs or CAF containing inserts were placed into the top of the well. One week later, all Panc1 and HTB147-containing wells were treated with three concentrations of Gemcitabine (10, 40, 80 nM). Following 72 h of treatment, cell viability was determined using trypan blue exclusion assay (Vi-CELL Cell Viability Analyzer, Indianapolis, IN). To examine the effect of disrupting the CXCL12/CXCR4 interaction on Gemcitabine sensitivity, cells were treated with Gemcitabine 80 nM and CXCR4 antagonist; AMD3100 (15 uM) and cell viability determined 72 h post-treatment. Indirect coculture of pancreatic cancer cells and stromal cells was carried out using cell culture insertsfrom BD Falcon (Franklin Lake, New Jersey). Pancreatic cancer cells were seeded into 24 well-plate and stromal cells were seeded in inserts and incubated overnight which were then placed on the 24 well plates. Cells were allowed to grow for a week before being treated with Gemcitabine alone or in combination with AMD3100 or Phloretin. Panc-1 cells were seeded into the bottom chamber of a transwell chamber plate and the accompanying Panc-1 or CAFs containing inserts were placed on the top the well. Following 7 days of coculture all Panc1-containing wells were treated with Gemcitabine for 24 hr to determine MEK-1&2, p MEK-1&2, ERK1&2, pERK-1&2, Akt, and pAkt protein levels. Cells were processed for protein extraction and Western blotting using standard procedures. Detection was carried out using specific antibodies: Akt, pAkt ERK1/2 pERK1/2, MEK1/2, and pMEK1/2 (1:1000) and GAPDH (1:20000). All secondary antibodies were used at 1:2500 dilutions. All antibodies were purchased from Santa Cruz Biotechnology (Oxnard, CA). Total RNA was extracted from Panc-1 cells with Trizol Reagent was purchased from Ambion/RNA Life technologies (Grand Island, NY). The primerprobe sequences for Mn-SOD, G6PD, CXCR4 and GAPDH were all pre-designed and purchased commercially from Integrated DNA Technology (Coralville, Iowa). PCR products were separated by electrophoresis through ethidium bromide-stained 1% agarose gel and visualized by ultraviolet light. CAFs were generated from MSCs by exposure to tumor conditioned medium (TCM) from Panc-1 or HTB147 cells five times per week for 4 weeks by a method previously established in our laboratory . Panc-1 cells were seeded in 6-well plates and allowed to grow to 60–80% confluency. Transfection was carried out as per the manufacturer’s protocol. CXCR-4 sh RNA plasmid, transfection media and reagents were purchased from Santa Cruz Biotechnology (Oxnard, California). Western Blot and RT-PCR were performed to confirm CXCR4 knockdown. 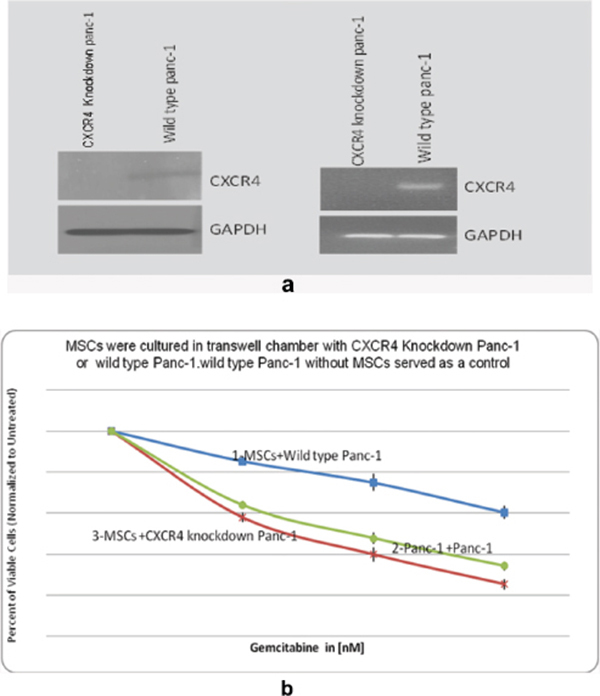 Panc-1 CXCR4 knockdown cells were co cultured in transwells with stromal cells and compared with wild type Panc-1 cocultured with stromal cells. SOD activity kit was purchased from ENZO Life Sciences (Farmingdale, NY). SOD activity was measured according to the manufacturer’s protocol. Pancreatic cancer cells were seeded into 24 well-plate and stromal cells were seeded in inserts and incubated overnight then we transfer insert into plates. Cells then allowed to grow for a week before being treated with Gemcitabine or AMD3100 or Phloretin. After 24 hrs, cells were washed with 1X PBS and harvested by trypsinization. Cells were then centrifuged and supernatant was discarded. Cells were resuspended in 5–6 volumes of cold 1X cell extraction buffer, and centrifuged. A 96-well plate was used for this assay. First, 25 μlof 1X SOD buffer was added to the bottom of the activity control wells, 25 μlof prepared SOD standards from number 1 through number 7 were added to the bottom of the appropriate wells and 25 μl of diluted samples were added to the bottom of the appropriate wells. All standards, controls and samples were run in triplicate. Then master mix (10X SOD buffer, xanthine oxidase, distilled water, WST-1 reagent) was added to all wells. To initiate the reaction, 1X xanthine solution was added to all wells. The assay plate was then transferred immediately to determine rate of change in absorbance using microtiter plate reader where the absorbance was recorded every minute for ten minutes (at 450 nm). The absorbance values were plotted versus times in minutes and slope of each curve was taken. Percent inhibition of the rate of change in absorbance at 450 nm and SOD activity in the samples was calculated using equations provided in the manufacturer’s protocol. The in vitro scratch assay is used to study effect of cell-cell interactions on cell migration. A scratch was made in pancreatic cancer cell monolayer in presence or absence of CCM (CAF Conditioned Media) and cells were allowed to fill the gap over time. Images were taken at day zero (the beginning) using Nikon Eclipse light microscope under 40X magnification and gap filling by cells was monitored over a 7 day period. Immunocompromised mice (NODSCID mice, Taconic Farms, NY) were inoculated subcutaneously with 5 × 106 Panc-1 cells and 1 × 106 bone marrow derived MSCs as the stromal cells. Treatment was started when palpable tumors were noted. The first group served as a control group and was left untreated. The second group received two injections of Gemcitabine at 60 mg/kg on day 5 and at 30 mg/kg on day 14. The third group received Phloretin at 10 mg/kg on days 5, 7, 10 and 14. The fourth group received two injections of a combination of Gemcitabine and Phloretin on day 5 (60 mg/kg Gemcitabine plus 10 mg/kg Phloretin) and day 14 (30 mg/kg Gemcitabine and 10 mg/kg Phloretin). In addition, the combination group received Phloretin at 10 mg/kg on days 5, 7, 10 and 14 similar to the Phloretin alone group. The days and doses were chosen such that drugs alone do not produce any tumor growth inhibition and the combination (at a very well tolerated dose and schedule) shows the desired effect. Panc1 were seeded into the bottom chamber of a Boyden Chamber Plate and the accompanying (Panc-1 or MSCs or CAFs) inserts were placed into the top chamber. Cancer cell growth was determined by cell counting using Trypan Blue Exclusion Assay. A statistically significant increase was observed in pancreatic cancer cell growth in presence of stromal cells in both cell lines, Panc-1 and HTB147 (p-value, <0.006 and 0.005, respectively) pointing to the contributory role of stromal cells in pancreatic cancer cell proliferation and progression (data not shown). We examined the role of CXCR4/CXCL12 signaling pathway in pancreatic cancer cell chemoresistance. 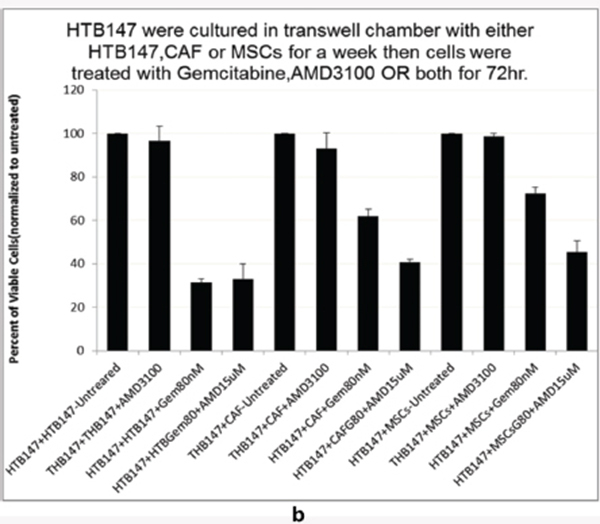 Pancreatic cancer cells (Panc1 and HTB147) were treated with different doses of Gemcitabine (0, 10, 40, 80 nM) in the presence or absence of CAF or MSCs. Our data shown in Figure 2a and 2b indicates that presence of stromal cells reduced the cytotoxicity of Gemcitabine in both pancreatic cancer cell lines Panc-1 and HTB147 respectively. As stated earlier, CXCR4 expressed on pancreatic stromal cells was shown to be essential for their invasive and metastatic properties, suggesting a strong correlation with disease progression. Figure 2 Significant protection of pancreatic cancer cells, Panc1 (Figure 2a) and HTB147 (Figure 2b) from Gemcitabine cytotoxicity effects was observed in presence of stromal cells. Data are presented as relative survival with respect to untreated pancreatic cancer cells as a control for the growth-promoting effect stromal cells. We examined the CXCR4/CXCL12 downstream signaling pathways that might mediate the stromal cells induced pancreatic cancer cells chemoresistance to Gemcitabine. We investigated the effect of stromal cells on the MAPK signaling pathway and the activation of Akt, MEK and ERK. Our data showed significant activation of all three effector proteins in presence of stromal cells (Figure 3). 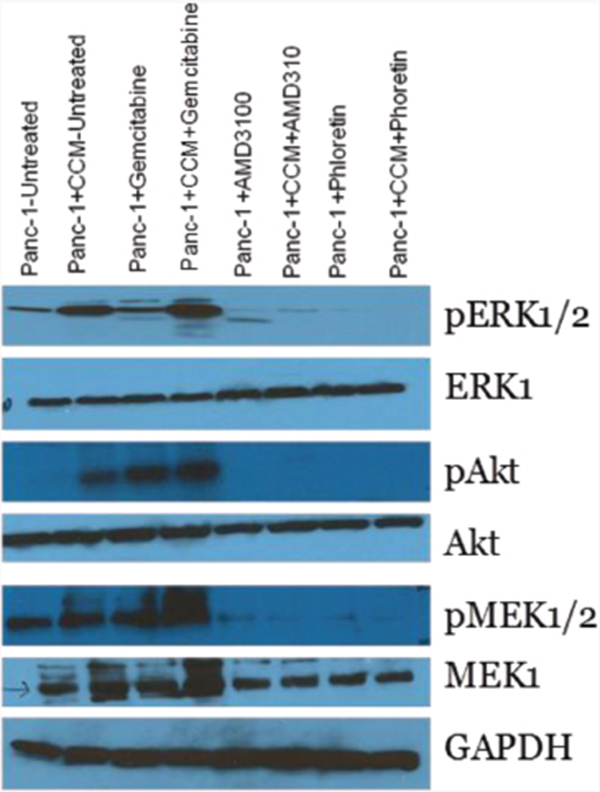 Figure 3 Stromal cells induce activation of MEK, Akt, and ERK pathways in pancreatic cancer cells. 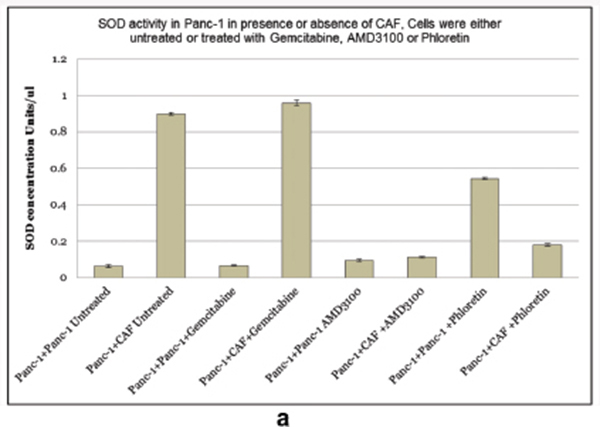 Panc1 cell cultures were treated with stromal cell-conditioned media alone or with Gemcitabine (80 nM) or AMD3100 (15 μM) or Phloretin (100 μM) for 24 hrs., Panc-1 treated with Gemcitabine or AMD3100 (15 μM) or Phloretin (100 μM) for 24 hrs as controls. The data also indicates that AMD3100 and Phloretin can inhibit ERK, MEK and Akt phosphorylation in Panc-1 cells even in presence of stromal cell conditioned medium. Having observed the role of activation of CXCR4/CXCL12 signaling pathway in induction of pancreatic cancer cell growth, migration and Gemcitabine resistance, we investigated if CXCR4 antagonist,AMD3100, could antagonize stromal cell-induced Gemcitabine resistance in pancreatic cancer cells. Co-treatment with AMD3100 abrogated the stromal cell-induced cell signaling and Gemcitabine resistance of pancreatic cancer cells (Figure 4a and 4b). These findings indicate that stromal cell-mediated pancreatic cancer cell response is associated with CXCR4 and downstream signaling. In order to determine whether CXCR4/CXC12 interaction was directly responsible for the stromal cell induced drug resistance we knocked down CXCR4 expression in Panc-1 cells. We observed that stromal cells mediated-Gemcitabine resistance in pancreatic cancer cells was abrogated by the CXCR4 knockdown in Panc-1. CXCR4 knocked down Panc-1 (Figure 5a) were even more sensitive to Gemcitabine than wild type Panc-1 in presence of stromal cells (Figure 5b). This observation indicates that stromal cells mediate Gemcitabine drug resistance in pancreatic cancer cells was directly mediated by CXCR4/CXCL12 interaction. 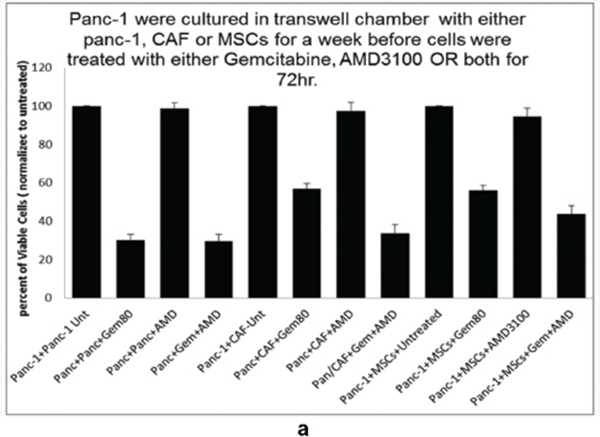 Figure 4a Stromal cell exposed-pancreatic cancer cell line Panc-1 exhibits significant protection from Gemcitabine cytotoxicity effects. Drug sensitivity of Panc-1 cells was restored by AMD3100 even in presence of stromal cells. 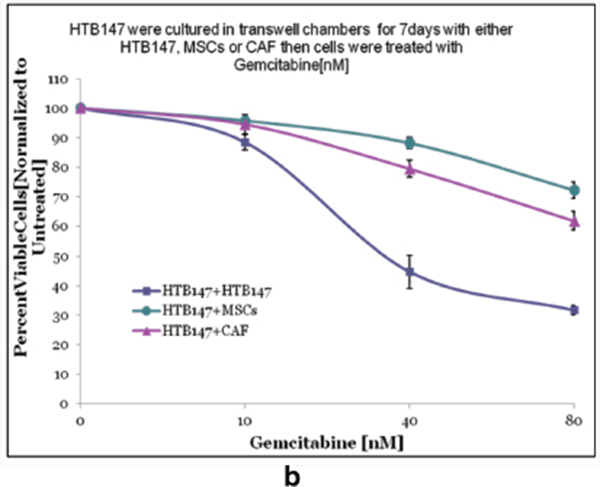 Figure 4b Stromal cell exposed-pancreatic cancer cell line HTB147 exhibited significant protection from Gemcitabine cytotoxicity. When AMD3100 was combined with Gemcitabine drug sensitivity of human pancreatic cancer cells was restored even in presence of stromal cells. The bars represent identical experiments carried out for Panc-1 cells and shown in Figure 4a. As Gemcitabine is known to induce ROS pathway in cells, we investigated the role of Phloretinas a ROS system modulator in the CXCL12/CXCR4-dependent MAPK signaling and stromal cell-mediated modulation of the growth and drug resistance of pancreatic cancer cells. Our findings showed that Phloretin displayed antitumor effects through inhibition and downregulation of superoxide dismutase which may have led to elevation of ROS concentration in the cancer cells and increased cell death. Figure 5 CXCR4 plays a crucial role in Gemcitabine resistance. Figure 5a Successful knockdown of CXCR4 as shown by RT-PCR (right panel) and Western blotting (left panel) in Panc-1 cells. 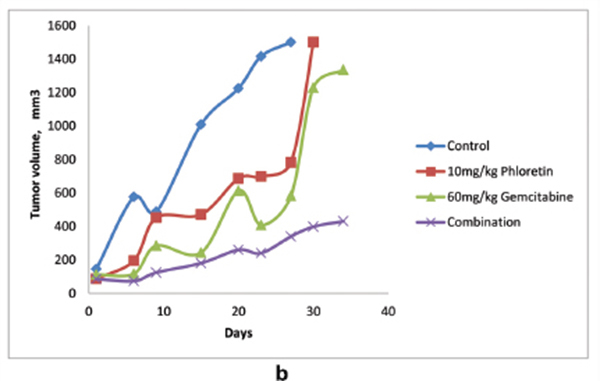 Figure 5b Gemcitabine cytotoxicity experiment with wild type versus CXCR4 knockdown Panc-1 in presence of stromal cells indicates restoration of drug sensitivity in CXCR4 knock down cells. Phloretin also inhibited the CXCL2/CXCR4 downstream signaling pathway including ERK, MEK and Akt phosphorylation in Panc-1 cells even in presence of stromal cell conditioned medium (data not shown). Our in vitro data suggested that Phloretin as well as AMD3100 attenuated the induction of SOD activity in Panc-1 cells. Phloretin also reversed the drug resistance of Panc-1 cells to Gemcitabine in presence of CAFs. Based on these results we hypothesized that a combination of Phloretin and Gemcitabine would be an effective antitumor approach to control the growth of pancreatic cancers in a tumor xenograft model. Xenografts of human Panc-1 cells were grown in immune compromised mice and when the tumors reached palpable size, treatment with the combination (Phloretin and Gemcitabine) and single drugs alone were initiated (Gemcitabine alone and Phloretinalone). Figure 6b shows the results of this tumor xenograft experiment. It is evident that the combination group had the smallest tumor throughout the duration of the experiment (all treatments were stopped at day 14) while all other groups showed increased tumor growth despite treatment. The control group developed large tumors on day 22 and all animals in this group were euthanized. The purpose of including two extra injections of Phloretin between the administration of Gemcitabine-Phloretin combination was to ensure that enough Phloretin was present in the system to inhibit induction of CAF mediated SOD in the tumor cells. This strategy proved quite effective in controlling tumor size (see combination versus drugs alone curves in Figure 6b). Figure 6a Stromal cells induce SOD levels in Panc-1 cells possibly explaining the resultant increase in cancer cell survival in presence of Gemcitabine. AMD 3100 as well as Phloretin attenuated stromal cell induced SOD activity in Panc-1 cells and restore drug sensitivity. Gemcitabine alone given on day 5 (60 mg/kg), and day 14 (30 mg/kg). Phloretin alone given on day 5, 7, 10, 14 (10 mg/kg on all days). Combination of Gemcitabine and Phloretin: Gemcitabine given on day 5 (60 mg/kg), and day 14 (30 mg/kg) and Phloretin given on days 5, 7, 10 and 14 (10 mg/kg on all days). Most of the pancreatic cancer cases are diagnosed late, when the disease is already advanced and metastasized to other organs. At diagnosis, only 20% of pancreatic cancer patients are candidates for tumor surgical resection [7, 8], therefore chemotherapy, in particular Gemcitabine, is considered the only treatment option for advanced pancreatic cancer cases. Resistance to Gemcitabine is a major issue in treatment of pancreatic cancer patients, therefore understanding the molecular mechanisms of chemoresistance in pancreatic cancer is important in developing novel therapeutic approaches. For many years, cancer research has focused mainly on the cancer cell and its molecular changes; however, an increasing body of evidence suggests that the tumor microenvironment (TME) is an important factor in mediating tumorigenesis and chemotherapeuticresistance . Moreover, several studies have shown that stromal cells can induce resistance to various anticancer treatments, such as tamoxifen in the treatment of breast cancer, paclitaxel in the treatment of non–small cell lung cancer, cetuximab in treatment of head and neck squamous cell carcinoma and cytarabine in treatment of acute leukemia [16, 19]. To our knowledge this is the first work to investigate the CXCR4/CXCL12 signaling pathways and ROS system mechanisms in stromal cells influence on growth, invasiveness and drug response in human pancreatic cancer cells. Our previous work carried out in collaboration with the Verma group at Albert Einstein shows that exposure of stromal cells to conditioned medium from pancreatic cancer cells results in overexpression of the chemokine receptor CXCR4 on the surface of stromal cells as well as its ligand CXCL12, causing an increase in cancer cell growth and invasion. In this study, we investigated the role of CXCR4/CXCL12 signaling axis in rescuing pancreatic cancer cells from the cytotoxic effects of Gemcitabine in two separate pancreatic cancer cell lines. We noticed statistically significant protection of pancreatic cancer cells from Gemcitabine cytotoxicity in presence of stromal cells, indicating the importance of CXCR4/CXCL12 signaling pathway in pancreatic cancer drug resistance. We further studied mechanisms of pancreatic cancer cell resistance to Gemcitabine. Gemcitabine is a ROS system inducer, and causes an increase of ROS in cancer cells, thereby cell death. Resistant pancreatic cancer cells have low ROS as a protective mechanism from Gemcitabine cytotoxicity. We demonstrated that the modulation of ROS levels in Panc-1 is stromal cell-mediated through induction of SOD (Figure 6a). We also examined the activation of downstream signaling pathways. Binding of CXCL12 to CXCR4 receptors causes the activation of MEK, Akt, and ERK. In a recent study, activation of, Akt and ERK have been shown to enhance survival signaling . Moreover, activation of ERK and Akt pathways has been associated with pancreatic cancer cells chemoresistance [24, 25]. Role of MEKin chemoresistancein pancreatic cancer cells was shown to be mediated directly by the activation of CXCR12/CXCR4 pathway . In this study, we have demonstrated that stromal cells in the tumor microenvironment play a contributory role in pancreatic cancer cell growth, invasion and chemotherapeutic resistance to Gemcitabine. The combination of a standard chemotherapy agent Gemcitabinewith either AMD3100 (CXCR4 antagonist) or Phloretin (ROS inhibitor) inhibited pancreatic cancer cell growth and drug resistance by inhibition of MAPK downstream pathway of the CXCR4/CXCL12 axis and by regulation of ROS system. Figure 7 depicts our current understanding of the tumor microenvironment influenced CXCR4/CXCL12 interaction and downstream signaling in pancreatic cancer cells and ROS modulation. Figure 7 New schematic diagram of CXCR4/CXCL12 downstream signaling pathway. 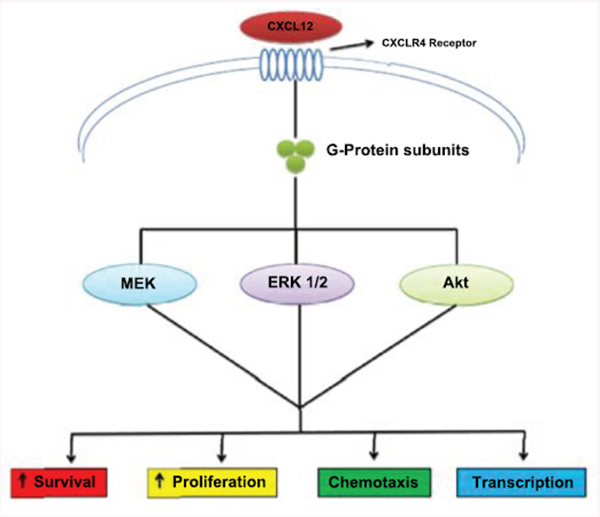 Binding of CXCL12 to CXCR4 receptor leads to activation of ERK, Akt and MEK and increased survival, proliferation, chemotaxis and gene transcription and in addition, ROS modulation results in increased survival, proliferation and drug resistance. Our findings strongly support the idea that modulation of ROS production by inhibition of SOD may be a good strategy to overcome Gemcitabine resistance in pancreatic cancer cells. Our results demonstrated that CAF mediated SOD induction (and therefore ROS modulation) was involved in Gemcitabine resistance that reversal of SOD induction restored Gemcitabine sensitivity. This hypothesis was also proven in vivo where the combination of Gemcitabine and Phloretin was more effective in controlling tumor growth than the drugs alone. Our future studies will be directed toward measuring levels of SOD in tumors harvested from animals following Gemcitabine-Phloretin treatment as compared with the other groups. The goal will be establish an optimum dose and schedule to control tumor growth based on tumor SOD levels which may serve as a useful biomarker. We initially focused on MnSOD although we are aware of several other forms and it will be important to discriminate between the various forms of SOD present in tumor cells to determine which particular SOD maybe a biomarker for tumor growth and drug response. The authors have no conflict of interest to declare. This work was carried out as part fulfillment of the thesis requirement of Master of Clinical and Translational Science at GSBS for A. A under the mentorship of DB. BBP, SW and NJ helped with many aspects of the work and in writing the manuscript. Thota, R., J. M. Pauff, and J. D., Berlin. 2014. Treatment of metastatic pancreatic adenocarcinoma: a review. Oncology (Williston Park) 28 (1): 70–74. PubMed PMID:24683721. Domanska, U. M., R. C. Kruizinga, W. B. Nagengast, H. Timmer-Bosscha, G. Huls, E. G. de Vries, and A. M. Walenkamp. 2013. A review on CXCR4/CXCL12 axis in oncology: no place to hide (Review). Eur. J. Cancer 49 (1): 219–230. doi: 10.1016/j.ejca.2012.05.005. PubMed PMID:22683307. Statistics and outlook for pancreatic cancer. 2013. Cancer Research UK www.cancerresearchuk.org/cancer…/pancreatic-canc. Powis M. E., and K. J. Chang. 2000. Endoscopic ultrasound in the clinical staging and management of pancreatic cancer: its impact on cost of treatment (Review). Cancer Contr. 7 (5): 413–420. PubMed PMID:11000610. Pancreatic Cancer Action. NCIN Cancer Prevalence Atlas http://www. ncin.org.uk/Prevalence/1 5 10 Year/atlas.html, 31/07/2012. Medscape. 2014. Surgery is the primary mode of treatment for pancreatic cancer. However, an important role exists for chemotherapy and/or radiation therapy. emedicine.medscape.com/article/280605-overview. Donadelli, M., I. Dando, T. Zaniboni, C. Costanzo, E. DallaPozza, M. T. Scupoli, A. Scarpa, S. Zappavigna, M. Marra, A. Abbruzzese, M. Bifulco, M. Caraglia, and M. Palmieri. 2011. Gemcitabine/ cannabinoid combination triggers autophagy in pancreatic cancer cells through a ROS-mediated mechanism. Cell Death Dis. 2 (4): e152. doi: 10.1038/cddis.2011.36. PMCID:PMC3122066. Diehn, M., R. W. Cho, N. A. Lobo, T. Kalisky, M. J. Dorie, A. N. Kulp, D. Qian, J. S. Lam, L. E. Ailles, M. Wong, B. Joshua, M. J. Kaplan, I. Wapnir, F. M. Dirbas, G. Somlo, C. Garberoglio, B. Paz, J. Shen, S. K. Lau, S. R. Quake, J. M. Brown, I. L. Weissman, and M. F. Clarke. 2009. Association of reactive oxygen species levels and radioresistance in cancer stem cells. Nature 458 (7239): 780–783. doi: 10.1038/nature07733. PubMed PMID:19194462; PubMed Central PMCID:PMC2778612. Mini, E., S. Nobili, B. Caciagli, I. Landini, and T. Mazzei. 2006. Cellular pharmacology of Gemcitabine (Review). Ann. Oncol. 17 (Suppl 5): v7–v12. PubMed PMID:16807468. Arora, S., A. Bhardwaj, S. Singh, S. K. Srivastava, S. McClellan, C. S. Nirodi, G. A. Piazza, W. E. Grizzle, L. B. Owen, and A. P. Singh. 2013. An undesired effect of chemotherapy: gemcitabine promotes pancreatic cancer cell invasiveness through reactive oxygen species-dependent, nuclear factor κB- and hypoxia-inducible factor 1α-mediated up-regulation of CXCR4. J. Biol. Chem. 288 (29): 21197–21207. doi:10.1074/jbc.M113.484576. PubMed PMID: 23740244; PubMed Central PMCID:PMC3774385. American Chemical Society, Washington, DC. 1995. Polyphenolic pattern in apple tree leaves in relation to scab resistance. A preliminary study. J. Agric. Food Chem. 43 (8): 2273–2278 ISSN 0021-8561 CODENJAFCAU. Rezk, B. M., G. R. Haenen, W. J. van der Vijgh, and A. Bast. 2002. The antioxidant activity of Phloretin: the disclosure of a new antioxidant pharmacophore in flavonoids. Biochem. Biophys. Res. Commun. 295 (1): 9–13. PubMed PMID:12083758. Bergman, M., A. Perelman, Z. Dubinsky, and S. Grossman. 2003. Scavenging of reactive oxygen species by a novel glucurinated flavonoid antioxidant isolated and purified from spinach. Phytochemistry 62 (5): 753–762. PubMed PMID:12620328. Mahadevan, D., and D. D. Von Hoff. 2007. Tumor–stroma interactions in pancreatic ductal Adenocarcinoma (Review). Mol. Cancer Ther. 6 (4): 1186–1197. PubMed PMID:17406031. Houthuijzen, J. M., L. G. Daenen, J. M. Roodhart, and E. E. Voest. 2012. The role of mesenchymal stem cells in anti-cancer drug resistance and tumour progression (Review). Br. J. Cancer 106 (12): 1901–1906. doi: 10.1038/bjc.2012.201. PubMed PMID: 22596239; PubMed Central PMCID: PMC3388567. Mishra, P., D. Banerjee, A., and Ben-Baruch. 2011. Chemokines at the crossroads of tumor-fibroblast interactions that promote malignancy (Review). J. Leukoc. Biol. 89 (1): 31–39. doi: 10.1189/jlb.0310182. PubMed PMID:20628066. Bhagat, T. D., Y. Rattigan, B. Patel,·S. Mirte,·Y. Yu, D. Sohal, et al. 2013. Pancreatic cancer associated fibroblasts are characterized by widespread epigenetic reprogramming that leads to aberrant expression of druggable target CXCR4. Abstract Number: 1504 AACR Annual Meeting Washington DC. Macanas-Pirard, P., Leisewitz A, Broekhuizen R, Cautivo K, Barriga FM, Leisewitz F, Gidi V, Riquelme E, Montecinos VP, Swett P, Besa P, Ramirez P, Ocqueteau M, Kalergis AM, Holt M, Rettig M, DiPersio JF, Nervi B. Bone marrow stromal cells modulate mouse ENT1 activity and protect leukemia cells from cytarabine induced apoptosis. PLoS One. 2012; 7 (5): e37203. doi: 10.1371/journal.pone. 0037203. PubMed PMID: 22629369; PubMed Central PMCID: PMC3358339. Gao, H., W. Priebe, J. Glod, D. Banerjee. 2009. Activation of signal transducers and activators of transcription 3 and focal adhesion kinase by stromal cell-derived factor 1 is required for migration of human mesenchymal stem cells in response to tumor cell-conditioned medium. Stem Cells 27 (4): 857–865. doi: 10.1002/stem.23. PubMed PMID:19350687. Teicher, B. A., and S. P. Fricker. 2010. CXCL12 (SDF-1)/CXCR4 pathway in cancer (Review). Clin. Cancer Res. 16 (11): 2927–2931. doi: 10.1158/1078-0432.CCR-09-2329. PubMed PMID:20484021. Macanas-Pirard, P., A. Leisewitz, R. Broekhuizen, K. Cautivo, F. M. Barriga, F. Leisewitz, V. Gidi, E. Riquelme, V. P. Montecinos, P. Swett, P. Besa, P. Ramirez, M. Ocqueteau, A. M. Kalergis, M. Holt, M. Rettig, J. F. DiPersio, B. Nervi. 2012 Bone marrow stromal cells modulate mouse ENT1 activity and protect leukemia cells from cytarabine induced apoptosis. PLoS One. 7 (5): e37203. doi: 10.1371/journal.pone.0037203. PubMed PMID:22629369; PubMed Central PMCID:PMC3358339. Turrens, J. F. 2003. Mitochondrial formation of reactive oxygen species (Review). J. Physiol. 552 (Pt 2): 335–344. PubMed PMID:14561818; PubMed Central PMCID:PMC2343396. Wagner, B. A., G. R. Buettner, and C. P. Burns. 1994. Free radical-mediated lipid peroxidation in cells: oxidizability is a function of cell lipid bis-allylic hydrogen content. Biochemistry 33 (15): 4449–4453. PubMed PMID:8161499. Chetram, M. A., C. V. Hinton. 2013. ROS-mediated regulation of CXCR4 in cancer. Front. Biol. (Beijing) 8 (3). doi: 10.1007/s11515-012-1204-4. PubMed PMID:24223583; PubMed Central PMCID:PMC3820291. Middleton, G., P. Ghaneh, E. Costello, W. Greenhalf, and J. P. Neoptolemos. 2008. New treatment options for advanced pancreatic cancer (Review). Expert Rev. GastroenterolHepatol. 2 (5): 673–696. doi: 10.1586/17474124.2.5.673. PubMed PMID:19072345. Ishida T., A. Nakaizumi, S. Tanaka, and M. Tatsuta. 2006. Early detection of pancreatic cancer (Review, Japanese). 64 (Suppl. 1): 155–159. PubMed PMID:16457240. Yokoi, K., and I. J. Fidler. 2004. Hypoxia increases resistance of human pancreatic cancer cells to apoptosis induced by Gemcitabine. Clin. Cancer Res. 10 (7): 2299–2306. PubMed PMID:15073105. Singh, A. P., S. Arora, A. Bhardwaj, S. K. Srivastava, M. P. Kadakia, B. Wang, W. E. Grizzle, L.B. Owen, S. Singh. 2012. CXCL12/CXCR4 protein signaling axis induces sonic hedgehog in pancreatic cancer cells via extracellular regulated kinase- and Akt kinase-mediated activation of nuclear factor κB: implications for bidirectional tumor– stromal interactions. J. Biol. Chem. 287 (46): 39115–39124. doi: 10.1074/jbc.M112.409581. PubMed PMID: 22995914; PubMed Central PMCID: PMC3493952. Chetram, M. A., and C. V. Hinton. 2013. ROS-mediated regulation of CXCR4 in cancer. Front. Biol. (Beijing) 8 (3). doi: 10.1007/s11515-012-1204-4. PubMed PMID:24223583; PubMed Central PMCID: PMC3820291. Trédan, O., C. M. Galmarini, K Patel, I. F. Tannock 2007. Drug resistance and the solid tumor microenvironment. J. Natl. Cancer Inst. 99 (19): 1441–1454. Review. PubMed PMID:17895480. Mishra, P. J., R. Humeniuk, D. J. Medina, G. Alexe, J. P. Mesirov, S. Ganesan, J. W. Glod, D. Banerjee. 2008. Carcinoma-associated fibroblast-like differentiation of human mesenchymal stem cells. Cancer Res. 68 (11): 4331–4339. doi: 10.1158/0008-5472.CAN-08-0943. PubMed PMID:18519693; PubMed Central PMCID: PMC2725025. International Journal of Translational Science, Vol. 1, 107–130. © 2015 River Publishers. All rights reserved.